There are monsters everywhere. From the hideous lash crawlers creeping in the darkest places deep beneath the earth to the rampaging boggarts, driven by insatiable hunger and lust to terrorize the lands around them, there seems to be no end to the variation in form and intent when it comes to monstrous creatures. While most monsters tend to be unique beings, spawned from pools of stagnant magic or demonic influence, a few have emerged as true species, able to reproduce despite their unnatural origins. Noisome Beasts explores some of the more famous breeds of monster to infest the world, specifically those that are noxious and toxic to creatures around them. In the following pages, you’ll find lore and customization options for the amphisbaena, basilisk, catoblepas, cockatrice, and the dreaded manticore. 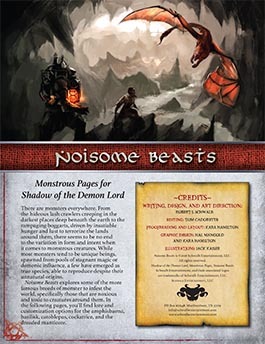 Buy Noisome Beasts PDF from Schwalb Entertainment or DriveThruRPG today!